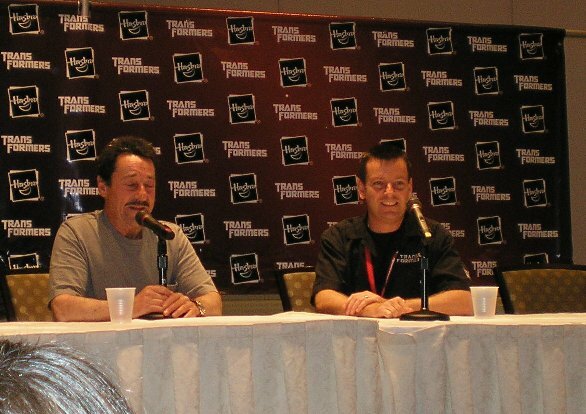 Above is Peter Cullen and Greg from Hasbro (who opened the panel, saying that Hasbro were really grateful to have Peter chosen for the Movie). - Is still overwhelmed by the fans after all these years. It was hard to describe the feeling of being in one of the biggest movies of the year. Likes being anonymous as a voice actor, especially when in public so that he doesn't get swamped with attention, but is finding himself being recognised more lately due to the new Movie. - He is proud that Optimus is such a positive Role model and icon to the community. Doesn't like doing evil character roles. - Recalled doing Optimus way back in 'a mere cartoon' at the time. And also talked about when he first did voices (animals, machines, etc), and wanting to do it as a career. He also talked about the recording sessions for the Gen1 cartoon with the voice director Wally Burr, including how he would make them record everything from scratch with each episode (Peter mentioned having to record things like 'screams'), and not just use prior recordings. - Said that, he had been told (by Paramount I guess) that if there was a sequel, he would be in it as Optimus again. He commented on how he auditioned for the role with a bigger, deeper version of the Optimus voice, and said that they still altered the recordings to sound even more resonating, which he wasn't expecting and only found out when watching the movie recently. Said that he also auditioned for Ironhide, but obviously didn't get it. - He first found out about the Movie Optimus not having a face plate at the MTV movie awards, but then realised that that was probably why they were filming him while he was recording the lines (for the facial expressions). - Mentioned recording of the computer game dialogue. - A comment relating to how Optimus is labled as sounding like John Wayne had Peter give some sample lines of both to show the difference. He even did some Optimus lines in a John Wayne voice to prove it.